Hunter is a recent graduate of the Comprehensive School Health Cohort and recipient of the Alex Trebek Leadership Award. Hunter’s community involvement and leadership made her a prime candidate for the award. While she is only beginning her career as a certified teacher, she has been involved with the community for over 9 years. The comprehensive school health cohort was appealing to Hunter, as she is a marathon runner and has always had a keen interest in healthy living. She has always been very active in sports, and hoped that through the comprehensive school health cohort, she would learn ways in which to apply her passions to teaching in the classroom. Through her experiences within the cohort, she has learned that she can integrate health into almost all topics. She can demonstrate to children that healthy living is not just a topic or class, but rather something which influences every aspect of their lives. With the foster families that she works with, she spends time with the children in teaching them about healthy choices. As these children often come from situations where they are not given the opportunity to learn about healthy options, or be able to partake in healthy activities. Recently, Hunter took the foster children to her cottage, where they were able to swim, and learn camping skills. Many of Hunter’s community engagement experiences began as assignments for her undergraduate or teaching degree (e.g., volunteering with the Canadian National Institute for the Blind and the Community Kitchen) to learn more about accessibility issues and working with impoverished communities, she got hooked and continued volunteering long after the projects were completed. 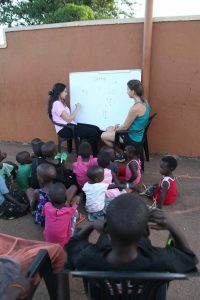 Most recently, Hunter went to Africa with Prof. Ruth Kane and colleagues to teach and support local schools in Uganda. Prior to this, she collaborated with her new colleagues to raise over $8000 to help the children pay their school tuition. Hunter’s advice to all new teacher candidates who are starting to think about comprehensive school health is to make friends, get involved, and get out of your comfort zone. Friends within the program and making connections are very helpful throughout your degree and for your professional learning. Additionally, during her practicum, Hunter volunteered to coach an after-school sports team. She stresses that this opportunity allowed her to get out of the classroom, and make more connections with colleagues and students. This provided her with a different experience to complement her in-class experiences. Going to Uganda was outside her comfort zone. However, Hunter stresses that it’s these experiences that she found the most rewarding personally and professionally. Finally, her favourite resource for teacher candidates is the Faculty of Education’s Resource Centre. She recommends going often, asking questions and exploring the wide variety of tools and other resources that you can utilize in developing your course work and in practicum. Hunter just completed her French as a Second Language certification and is hoping it will lead to more opportunities for teaching in the capital region. For now, she is on the supply list, and has just secured a Long Term Occasional (LTO) position.